Hate seeing videos of your over-achieving, athletic friends on social media?! Aren't we all?! 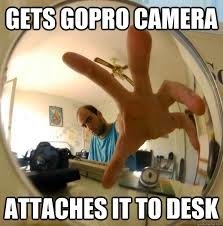 Now you can finally purchase the answer to the GoPro camera, the GoNoWhere camera!!! Who cares about someone wake boarding from a first person viewpoint? Personally, I get motion sickness just watching these mini films. I don't own any of that public school magic powder either, so it's a real problem. Why watch someone dirt biking in the Sahara when you could watch me eating potato chips and drinking Dr. Pepper from the chips point of view!!! You could be inside the ridges of my store brand potato chips, finally!! Better yet, strap the GoNoWhere camera to your cat's head and all of your friends can watch you read "Pride and Prejudice" cover to cover! Only, interrupted every few minutes to get a "cat's eye view" of it's own naughty bits, of course. Does the action stop there, you ask? OF COURSE IT DOESN'T!!!!! Contrary to the name the GoNoWhere camera actually goes everywhere! Your exciting daily routine can finally be put on display for the whole world to see! From doctors visits, endless hours of internet shopping, Pizza Hut deliveries, every sweet kill shot in Assasin's Creed you've ever made, watching Grey's Anatomy for the fifth time, personal grooming it's all there for your GoNoWhere camera to record and for your friends and family to cherish!